currently under construction at 16449 84th Avenue Northeast, Kenmore. Sales for available units range in price from $969,950 to over $1,124,950. Northshore Ridge has a total of 12 units, with 3 quick move-in homes currently for sale. Sizes range from 3215 to 3725 square feet. Model home now open for your tour. 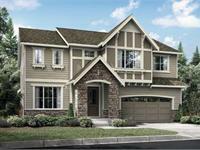 Northshore Ridge by RM Homes is a new community of 12 homes in Kenmore, WA. Great location on quiet street off Simonds Rd NE. Sought-after Northshore School District. Choose from two spacious home plans ranging from approximately 3,215 to 3,735 sq. ft. – some of our largest available plans anywhere. Homes have our highest level of interior finishes, and it’s all included with your home. Great rooms center around a fireplace with ceiling-height tile surround and wood mantle. Kitchens have a huge work island, quartz countertops, stainless steel farmhouse-style sink with pull-down faucet, soft close cabinets, extra pantry storage, custom-quality pendant lighting and stainless steel appliances with gas cooktop and in-wall oven/microwave combo. Master bedrooms are a true retreat, with room for a king-size bedroom set and extra seating, and a spa bathroom with floor-to-ceiling tile, quartz countertops on a dual-sink vanity, walk-in shower, separate water closet and a freestanding soaking tub. Homes have extra living spaces like bonus rooms, dens and outdoor living – great for entertaining and everyday living. Priced from the low $1Ms. Model home just released for sale! Includes all the extras - refrigerator, washer/dryer, air conditioning, accent paint and decorator touches, window blinds and full yard fencing, landscaping and irrigation! RM Homes is a locally-based homebuilder with decades of experience building homes for families and home buyers in the Puget Sound area. Stop by our designer-furnished model home this week. For more information or a private showing, contact Suzan Treece at 253.921.5953. Your inquiry will be delivered to the Northshore Ridge sales team, who will send you more information about this development.